Only a few years ago, the path to becoming an avid cyclist in Cleveland was no easy ride. Rentals were scarce, as were bike lanes. Owning a six-speed meant coughing up at least two hundred bucks and ponying up for a decent bolt-lock to boot. Before 2016, Cleveland as a bike-friendly city was a misnomer of sorts. The city boasted just 20 miles of bike trails (Columbus had more than 40), and unlike more than one hundred other U.S. cities, there was no bike sharing program. Then in fall of 2015, gears began to shift: Cuyahoga County obtained hundreds of thousands of formerly-federal funds for an infrastructure reboot with cyclists in mind. As far as added trails? Cycling advocates aimed for 70. Now here in the midst of the city’s two-wheeled redemption story, Fresh Water rounds up a host of options for locals of all riding skill levels. Best of all, no one is left on the bench. You don’t even need to own a bike to ride with the best of 'em. In 2009 in a meeting room at the Northeast Ohio Areawide Coordinating Agency (NOACA) on St. Clair Ave., nearly 150 pedal-pushers gathered to fix a head-smacking hole in local advocacy: there was no central group fighting for biker’s rights. After two years of consulting with shop owners, stakeholders and cyclists, Bike Cleveland was born ready to tackle the commuting cyclist’s overarching grievance — not enough bike lanes. VanSickle sites feasibility and infrastructure studies that boast about the correlation between “bike lane” and “safe street,” including one by the American Journal of Public Health that concludes dedicated lanes cut injury risk by up to 90 percent. The opposition cites the obvious: lanes are worthy only if a certain street has a high volume of bike traffic. That's not an easy sell when only 0.7 percent of Cleveland’s populace pedals to work. To garner the attention of public officials, VanSickle follows a YMCA-style of advocacy to push for safer pathways. Newbies can sign up for Bike Smarts, a series of staff-guided classes meant for aspiring everyday cyclists that tackle topics from how to stay hydrated, to building the perfect tool kit. The group also offers various information resources such as Bikes and The Law and Bike Theft Prevention. Ready for a group? Join one of Bike Cleveland’s various partner clubs — from Silver Wheels to Mind Brain Social — to stay in the loop. It’s a bike-social mentality that culminates in September’s NEOCycle festival when hundreds of cyclists convene for a celebratory ride around Edgewater Park. VanSickle’s theory is that the more dedicated cyclists Bike Cleveland can birth, the swifter the path to safer, improved bike infrastructure, although that’s somewhat of a paradox. In 2013, Sustainable Cleveland sponsored a Bike Sharing Feasibility Study to prove to Cuyahoga County that a strategic cycle rental system in the city was not only purposeful, it could also be profitable. The area is densely populated, ripe with young professionals, and has a mostly flat geography that's ideal for biking. 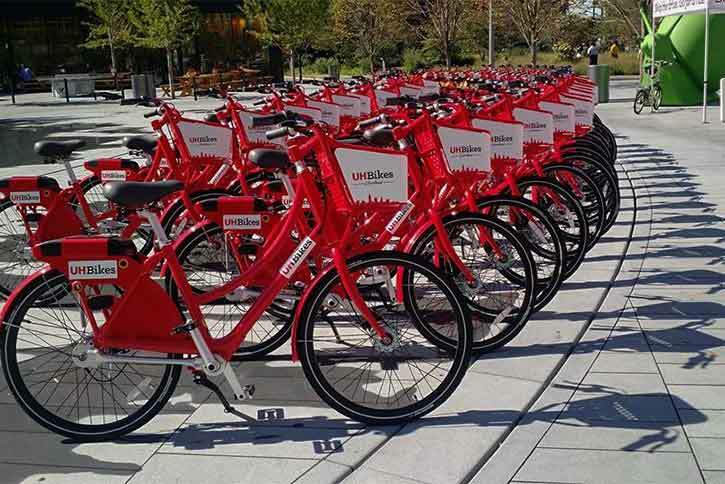 Using this study, VanSickle was able to garner about $350,000 from a redistributed federal fund, and launch a public-private venture to realize an amenity that 118 cities have been enjoying for more than a decade — an accessible public bike fleet. Last May, the Santa Monica-based CycleHop partnered with University Hospitals to design, build and install twenty-five, $25,000 stations, each populated with 10 fire truck-red, basket-wielding cycles in two major city zones, downtown and University Circle. Besides becoming the third Ohio city with a bike share system — Columbus and Cincinnati have had theirs since 2013 — UH Bikes gave Clevelanders not only an excuse to ditch their sedans for two-wheelers, but change their entire approach to commuting. The UH Bikes system is simple: it’s $3.50 for a 30-minute cruise — the program's most popular option, $15 for a monthly pass and $120 for a year. UH Bikes now boasts 26 stations, with one recently added on Adelbert Road in University Circle. The program has 3,026 active members biking some 23,000 miles and saving a calculated $13,362 in driving dollars. Because UH Bikes is not funded by city tax dollars, Baca says Cleveland’s bike share adoption is a win-win, mainly because of what’s called a “modal-shift,” or having a multitude of on-the-go transportation options that are like “having a plus one for your bike,” says Baca. Besides promoting multi-modality, UH Bikes also remedied Bike Cleveland’s everlasting plight: finding an accurate methodology to prove Cleveland’s demand for a better bike infrastructure. Baca yearns to see new stations along Euclid or Chester Avenues, but as of now, funds are scarce. As a constant push back, she regularly forwards all UH Bikes’ stats to City Hall. Although many neighborhoods await the amenity, with the influx of hundreds of pay-as-you-go cycles dotting the city, there is no longer the I-have-no-wheels-so-I-can't-ride excuse. But what if you have no one to ride with? Although Willsey has acted as Squad Leader for nearly four years, he says Slow Roll truly took off in 2016. Since then, his group, similar to other social clubs like Critical Mass or Lake Erie Wheelers, has been treading where bikers often don’t — in neighborhoods such as West Park and AsiaTown. All routes are drawn out beforehand, and Willsey does his best to accommodate every skill level. Inclusion is sort of Slow Roll’s philosophy. As of late? 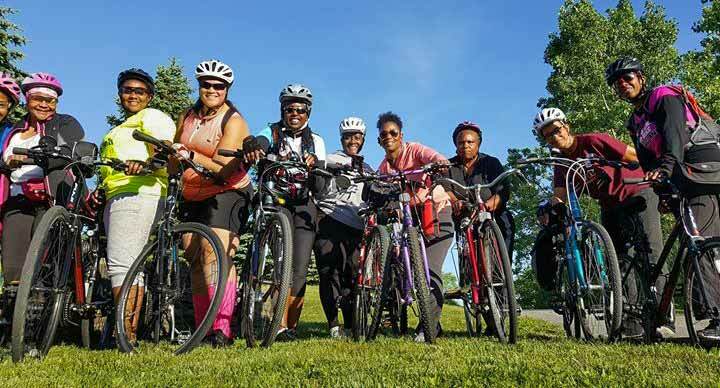 National movement Black Girls Do Bike and local Latino group Cleveland Cruisers have joined the fun. “We’ve seen everyone from little kids to 70-year-olds,” notes Willsey. Like Baca and VanSickle’s efforts, Willsey’s Slow Roll promotes the “advocacy is everywhere” push. Besides being a “party on wheels,” Slow Roll, Willsey says, is at once a visible statement and prime evidence that Clevelanders’ are itching to knock down barriers of what a bike ride should be. Currently numbering about 140 cyclists a week, Willsey wants to take Slow Roll into to the same neighborhoods on Baca’s lookout for bike-friendly improvement—Collinwood, Slavic Village and Kinsman to start, and he believes the expansion will cause Slow Roll's ridership to double this summer.